Actor David Tennant has signed up to reprise his role as Hamlet for BBC Two. The Doctor Who star recently completed a stint playing the prince on stage as part of a Royal Shakespeare Company production. He will be joined by all of the key members of its original cast, including Star Trek actor Patrick Stewart, who plays Claudius. Last week Tennant finished filming his farewell Doctor Who episodes, which will be shown later this year. He announced he was leaving the popular BBC show last year at the National Television Awards. BBC Two controller Janice Hadlow said the 180-minute screen production of Hamlet was "a wonderful opportunity... to bring one of the great stage successes of last year to a wider audience". Tickets for the stage performances, which opened in Stratford-Upon-Avon and later moved to London, sold out in hours. 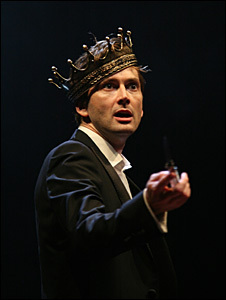 After his debut appearance, the Guardian called Tennant the "best Hamlet in years". "Contrary to press reports at the time, the RSC always had plans to make a recording of this production," said Gregory Doran, who directed the stage production. "The Hamlet cast and the RSC are all really delighted that we now have the chance to share this show with audiences around the world," he added. Earlier this year, Tennant's return to the stage as Hamlet was named the event of the year in the Whatsonstage.com Theatregoers' Choice Awards, which also saw Kenneth Branagh win best actor for Ivanov. Although the 38-year-old's performance was lauded by critics, he hurt his back and was unable to perform for a while as he recovered from surgery.